Idalion was an important city and well-known cult center of ancient Cyprus. The site is situated along the banks of the Yialias River at the edge of the Mesaoriea Plain. This location gave Idalion control of the valuable copper mines that played such an important role in the city’s growth. The area held other resources as well and had attracted settlement as early as the Neolithic. By the Middle and Late Cypriot period (1900-1000 BCE) settlement in the region had consolidated into the urban center of Agios Sozomenos, about 7 kilomters down river from Idalion. Agios Sozomenos appears to be the predecessor of Idalion and the sites reflect a pattern seen elsewhere on the island in which cities go out of use at the end of the Late Cypriot period followed by new Iron Settlements established nearby. The site of Idalion shows signs of activity dating back to the 13th C BCE. By the 7th C BCE the residents were erecting monumental buildings of sandstone imported from elsewhere on the island. The wealth of the city drew the envy of others, and around 500 BCE a massive wall was built around the site. These defenses held through at least one attack, but around 450 BCE the city was conquered by the people of Kition (present day Larnaca). The invaders destroyed the administrative complex and replaced it with buildings of their own, but the rest of the city was left to carry on with little interruption and remained undamaged. Idalion continued as an important copper processing center and cult site into the Roman period. By Medieval times the city had shrunk to a small village and shifted north to follow the changing course of the river. The village has preserved the memory of its ancient ancestor in its name, Dhali, and materials from archaeological site were stripped to be used over time and can still be seen in older buildings in the modern town. The area within the ancient city walls has been acquired by the Cypriot Department of Antiquities, which offers the site some protection although the remains of the tombs and sanctuaries that surrounded the ancient city are rapidly disappearing under relentless urban sprawl. Idalion has drawn the interest of antiquarians and archaeologists for a century and a half. In the 1860s, General Luigi Palma di Cesnola, American consul to the Ottoman Empire in Cyprus, boasted that he opened 15,000 tombs near the ancient city. His collection was so vast that the material played a significant role in the founding of the Metropolitan Museum of Art in New York and the British Museum in London. Not long after, R. Hamilton Lang excavated an open-air sanctuary on the eastern of the city’s 2 acropoleis. He was followed 15 years later by Max Ohnefalsch-Richter who conducted excavation at a number of shrines in the area as well as a temenos on the East Acropolis that he referred to as "the great chief sanctuary of the Idalion Aphrodite". The work of men was typical of their time and we are left with few records to reconstruct their excavations. In the 1930s, the Swedish Cyprus Expedition under the direction of Einar Gjerstad excavated most of the West Acropolis of Idalion with more modern techniques and publications. The Joint American Expedition under the direction of Lawrence E. Stager and Anita Walker began work at the ancient city in 1972. They also surveyed the region around Idalion and dug several other sites which helped create a clearer picture of the landscape, history, and development of the city. Pamela Gaber served as associate director from 1977 to 1979 and returned to take over American excavations on the site in 1986. It is Dr. Gaber's work that will be published on Open Context. Within the walls of Idalion there are two acropoleis overlooking the broad, level Lower City to their north. The majority of Dr. Gaber's work has taken place on a section of the East Acropolis, referred to as the East Terrace, and two areas in the Lower City, Lower City South and Lower City North. Excavation on the East Terrace revealed a large, outdoor sanctuary that was founded in the Late Geometric or Early Archaic period and remained in use through Roman times. The sanctuary was dedicated to the Wanax, or Lord, of the Cypriot pantheon. He was the consort of the Wanasa, the Lady, and the pair were worshipped across the Mesaoria Plain of Cyprus as Master and Mistress of Animals. By the Roman period the Wanax was known as Adonis and the Wanasa had become Aphrodite. The first signs of use in the Lower City North date to the Late Cypriot Period (13th century B.C.E.) Excavations revealed small scale industrial installations which included facilities for olive oil pressing and horn working. Several large pits dug into the bedrock were perhaps used as settling tanks for levigating clay. One of these pits was 4.5 meters wide and 3 meters deep and at some time in the 1st century B.C.E. it was reused as a bothros. A bothros is a place where sacred vessels and objects are deposited after they have been consecrated to a deity, but are no longer in use. This pit was full of pottery and artifacts and was topped with a stone-built altar complete with a burnt offering of goat or sheep bone. Lower City South was opened in the hopes of learning more about the domestic and industrial life of the city. Instead, the sanctuary associated with the bothros was uncovered. This unusual structure incorporated Cypro-Archaic votive sculptures which were built into later Hellenistic and Roman walls. Something not found elsewhere on site. Features in this sanctuary had more in common with Israelite and Canaanite cult practices than those of the Aegean. This included a pair of standing stones which were miniature versions of those found at Arad in Israel, several stone-built altars, and a betyl in a pit. Over 3 decades of excavation, Dr. Gaber’s work has generated hundreds of notebooks and thousands of drawings, photographs, maps, and other records. Formats range from slides to databases. Organizing and preparing these data for publication on Open Context will take time, and it was determined that the most meaningful way to present the material would be to divide it up by excavation area and upload it in segments. A major publication on the East Terrace excavations is currently in press, and it was decided that material from this field would make a good first dataset. Data from notebooks are being entered into the Idalion database to generate tables that include all artifact types and basic information about each locus. The goal is to provide the user with the most complete information that will be easy to query based on their own needs and research questions. Scanned and born digital drawings and photographs are being prepared to add to the tabular data. The process is currently in the stage of adding metadata to images and scanning paper drawings to be digitized in Adobe Illustrator. A number of brief documents are planned as well to help explain the data and point the user towards useful publications or other information. 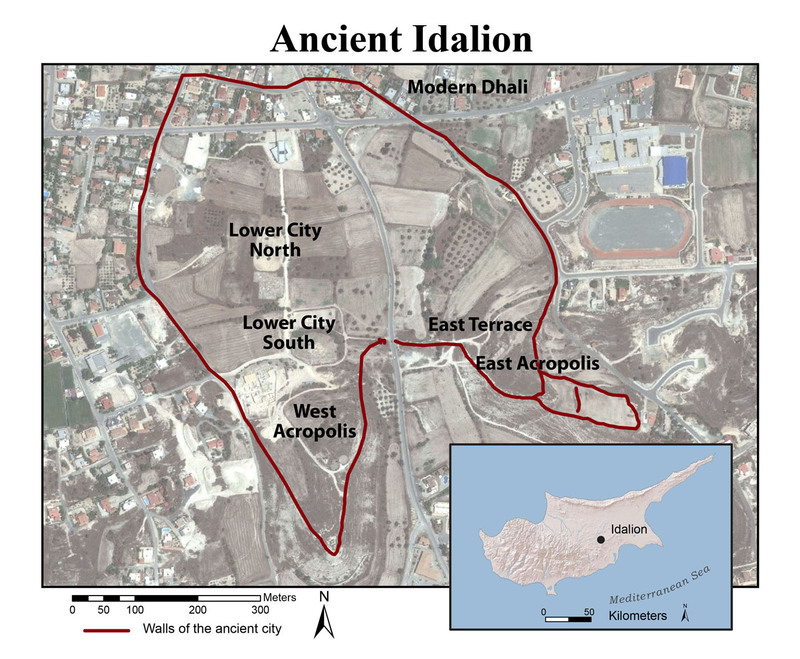 Geospatial data are vital for understanding archaeological sites and GIS results and files are included as part of the Idalion Open Context publication plan. Maps created by the previous excavators of the site are being georeferenced in ESRI ArcMap 10.4 with as much accuracy as possible. These are being used to create a map that combines the results of all these different excavations across the site. The map and the feature classes used to create it are an important part of the initial Idalion Open Context publication. In addition, the daily top plans from each trench are being entering into a GIS with the z-values included. This allows 3D visualization of each excavation unit. Large collections of material from Idalion, especially sculpture, exist in museum collections around the world in places like London, Berlin, and Stockholm. A major goal of the Idalion Open Context project is to link to these collections and try to connect the objects with their original find spots as close as possible. Contacts have made with a number of personnel from various museums who are enthusiastic about the idea and we look forward to expanding this aspect of the project.